Shipping weight = 0.23 lb. The SoloComb is an excellent grooming tool to shorten and thin the mane and tail of your horse without pulling, breaking, or tearing the hair. It’s also good for use on dogs. 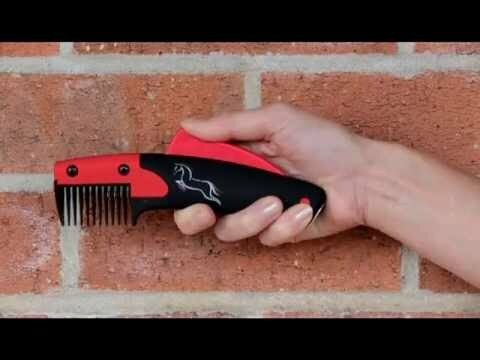 It achieves the same result as a conventional pulling comb, quickly and efficiently working without inflicting any pain. For additional information, please see the clickable link labeled Product Information listed under Downloadable Resources to the right. quick and easy. Results look great! Easy to use and my horse likes it too!! I gave it four stars instead of five because sometimes the hair gets caught in the blade. But my horse has a very thick mane so it could just be that. Finally a hassle free painless way to get my Buckskinâ? ?s main looking great. At first thought it could be larger but had her VERY thick mane done in no time...actually made it fun! This is so very easy to use and faster than pulling. I find that it looks so much nicer when done and my horse seems to like this better than pulling. My daughter can even do it without error. Hoping this will make mane pulling less painful for horse and human! I have a mini with a very thick mane and tail. I am hoping this will thin it out so it looks nice..
Much easier (and kinder) than pulling a mane. how and with which blade do you open and swap out? BEST ANSWER: Honestly I've only jist used the one it came with. Haven't had to change out any blades. Maybe you could go the product's web page and see if they have given those instructions. I purchased the replacement blades when I ordered the item. Blades can get dull if used often or rust if left out in the barn. Would this item be used to trim a Great Pyrenees dog? BEST ANSWER: You probably can use it to cut the dogs hair, but more recommended for horse hair, as its longer and usually used cutting there tail hair. If your dogs hair is that long it would most likely be companionable.